Parker, CO – January 20, 2012. 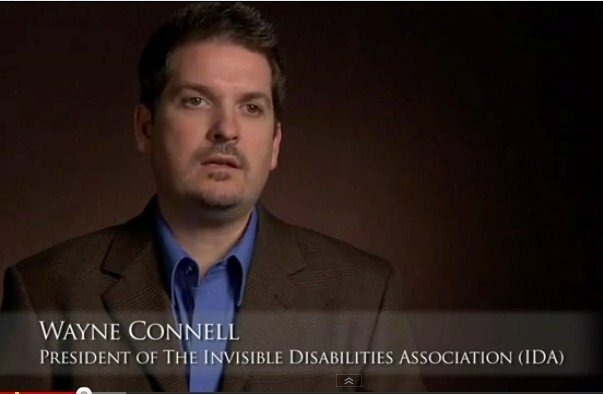 IDA Founder and President, Wayne Connell, was interviewed for the mini-documentary public service announcement (PSA), Invisible Wounds, Invisible Disabilities: The Realities of War. This film “brings light to the most misunderstood and prevalent wounds of war” (MultiWriters). It interviews many amazing warriors who have experienced invisible injuries such as PTSD and traumatic brain injury. Connell shares about invisible disabilities and how the “invisible-ness” can tend to make people not believe that the illness, injury or disability is real. Let us remember those who serve and who have served. May we also give time, efforts, love and understanding to those who have come home to a whole new battle with injuries, PTSD and/or TBI. Copyrighted © 2011 by Montalván & Associates, LLC. Luis Carlos Montalván, New York Times Bestselling Author of Until Tuesday. “The Invisible War” with IDA Speaker, Former Captain Luis Carlos Montaván at the 2011 IDA Awards Gala.